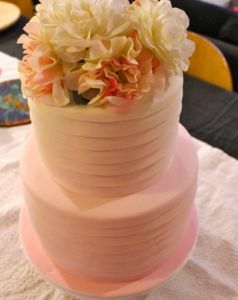 It's been a while since I've posted a wedding cake! Here's one I made for a work friend's wedding on Saturday. 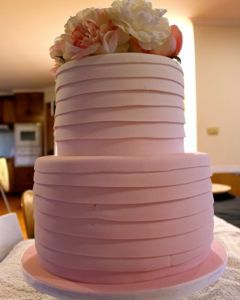 It's a little hard to tell (as I took the photos quickly in the early morning light), but it's actually an 'ombre' cake - in that the top stripes are cream, and they graduate in 15 differently shaded (scientifically calculated) stripes down to the soft pink base. The flowers are just my stunt flowers for the photos, it would have got real ones at the venue (hopefully). In other news I'm consoling myself for not being in Norway by spending lots of money - firstly on a work clothes spending spree (although as my clothes shops of choice also tend be the sort that also sell everything from gardening equipment to Lego I'm not hitting the credit card too hard with that stuff), but I have also booked our Christmas holiday to Adelaide, AND an Easter trip to Flinders Island. So that's dug a nice big hole in our post holiday finances but has given us a few exciting things to look forward to. One thing about being back at work is that my leave will be extremely restricted for the next 18 months or so, so I am very keen to make the most of every day off that I get.